Leif Gehrmann, MEng Software Engineering student at Heriot Watt University together with market-leading 3D mapping company Mapix technologies Ltd have been awarded first prize in the e-Placement Scotland Placement of the Year Awards at ScotSoft 2015, in recognition of an outstanding student placement. Leif worked with Mapix for three months using the skills learned on his computer science course to develop a web interface for the company, gaining wide experience and business awareness. e-Placement Scotland was established to close the computing skills gap by matching able students with high quality work placements across Scotland. In March, the programme, run by Edinburgh Napier University and the trade body for the digital technologies industry ScotlandIS, reached the milestone of its 1000th paid placement. Gert Riemersma, of Mapix technologies Ltd, said: “This was the first time we hired an e-Placement student and our experience has been first class. e-Placement Scotland found the perfect student for us. Leif has excellent software development skills, a keen interest in GIS (Geographic information Systems) which has hugely helped his understanding of the product and what was required, plus a natural curiosity to make things work better. In fact, Leif has been so useful to the business that at the end of his placement, he continued to work for us whilst completing his studies, and has now accepted a full time position”. Leif explained how he had a very rewarding time with the company: “Working at Mapix has given me the opportunity to contribute to an important, visible front-end part of the product, boosting both my confidence and expending my experience. Overall, I now understand that being able to work and collaborate with co-workers in the office is an important element of a placement and working life in general”. Two runner-up prizes were also awarded. Bogdan Ilin, MSc Information Systems Development student at Edinburgh Napier University together with Fuze Ceremonies were awarded with a runner-up prize. Fuze Ceremonies (and its sister company The Wedding Fixers) is a tech start-up that develops innovative wedding planner software. They employed Bogdan to assist with the development of a web application and a future mobile app, starting at the design stage through to the launch in May. Morag Webster, of Fuze Ceremonies, said: “It has been an incredible experience for everyone in the team so far. Without the e-placement scheme, we would not have been able to develop our app and it has helped us to make a step change in what we are doing. I cannot recommend this service highly enough, it is a great initiative”. 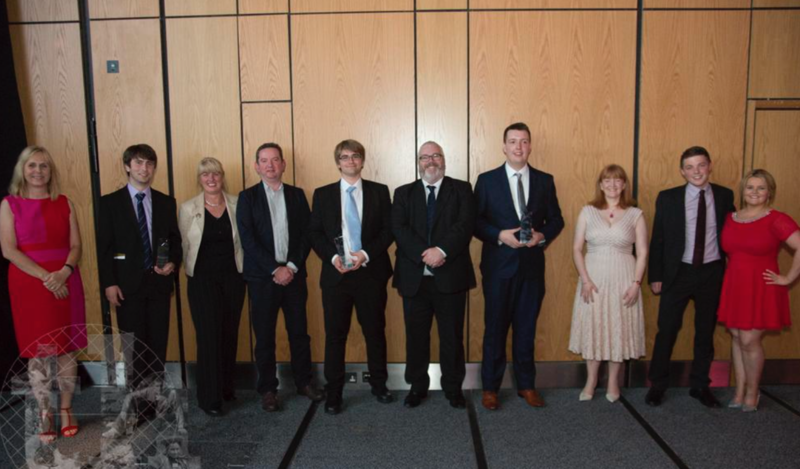 Jamie Stephen, BSc Business Technology student at University of the West of Scotland and Thermo Fisher Scientific, an American multinational, biotechnology product development company, were also awarded a runner up prize. The company created the role of ERP intern to allow each essential business function to gain the shared benefit of an additional resource at lower cost. Donald McNeil of Thermo Fisher Scientific, said: “Our ERP intern Jamie Stephen has been providing essential support for ERP activities across four business disciplines, to allow other team members to focus on projects. This has helped the teams improve their operational and service level performance”.